Growing up, I knew almost every line of Seinfeld. My father and I would spend ages entertaining each other repeating scenes and quotes while cooking dinner, standing in queues at the grocery store and during the show itself, probably to the great ire of many around us. That line still makes me laugh every time, bringing back visions of George, lacklustre and leaving the shop with no bread, or soup. Or frizzy-haired Elaine shouting the line to the chef when she discovers his recipe secrets in an armoire. Brilliant! So, it was no surprise that the lines of this famous episode were running through my mind as I headed to Nusa Kitchen recently to learn just how they make their soup – no sneaky armoire finds for me, I swear I was invited! Nusa, which has two locations in London, prides itself on making fresh soup from scratch every day with only fresh ingredients. From Singapore Seafood Laksa, to Thai Chilli Tofu Broth, much of the inspiration behind the soup comes from the experiences of owner Patou Sekhon’s childhood in Singapore. Her son, Mark, was on hand to tell me the history and how they came up with their ideas. “It was a bit of an accident. We said, “Let’s do food that’s hot.” We decided to give soup a go,” he explained. Patou comes up with the recipes at home and then visits to teach them to head chef Michael Bahda, who was took me through the recipes. The day begins, he said, at 5am when the team arrives to start making the soups in the basement of the Old Street location. All soup has to be done by the time the truck comes to pick up the supplies that will head over to the Adams Court location in the City. 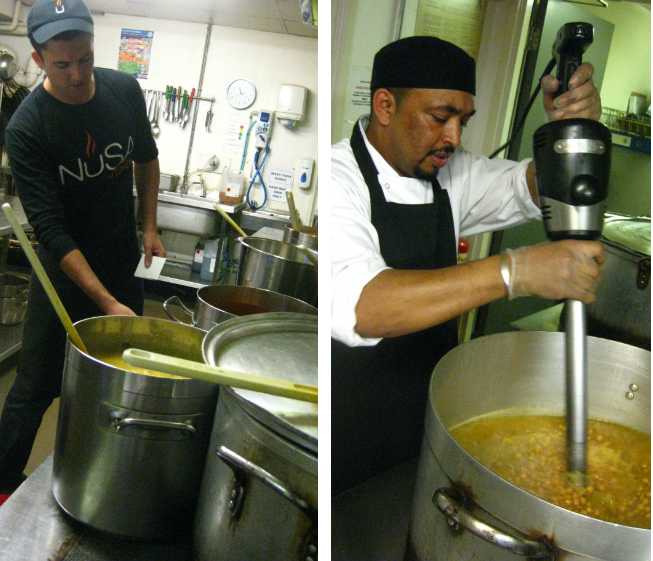 Often, the team makes 1000 litres of soup in a day! The “Soup Nazi” would be proud! As it was Friday, I didn’t have to arrive at the crack of dawn because it is a prep day for the team since the shops are not open at the weekend. Instead, I pitched up a much more reasonable 11am to see the process of soup making from start to finish and help the team get prepped for Monday’s lunchtime rush. After gathering the ingredients together for our two soups (Keema and Lemon Chickpea) Michael brought out two giant 55-litre pots and began frying the onions in each, while I stood by and took notes. He explained it is a very intense process and brute strength is needed to shift these pots when full. I was surprised how similar the Keema recipe was to making a curry – after the onions, we fried garlic, ginger, cumin, chili, turmeric and bay leaves, before adding (salt-free) stock, 7.5 kilos of beef mince and water. Unlike a lot of shop-bought soups out there, the recipes use no added salt, which makes them healthier. We went through a similar routine with the lemony chickpea soup – frying onions and spices, before adding wine and chickpeas and allowing to cook for a while. 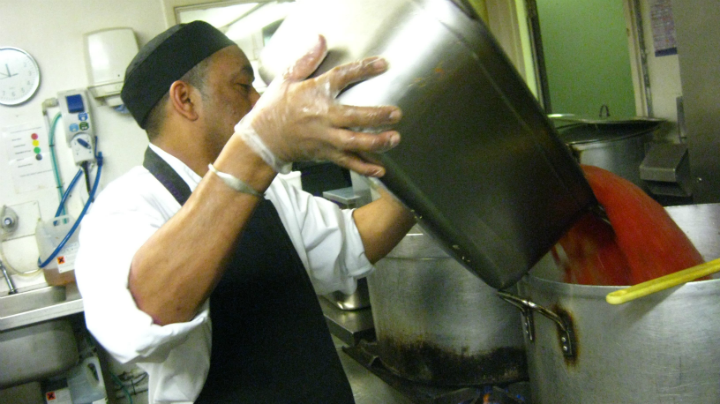 The smells in the kitchen were intense – and only made my hungry tummy grumble more. The savoury spices floated through the air while the bubbling coconut milk of one of that day’s lunchtime soups lent a sweet flavour to it all. As we waited for the soups to finish, Michael gave me samples of some of the other soups that would be on offer the following week. As the soups are on a four-week rotation, any soups featured only have a short time to impress customers, who will hopefully remember their delicious blends down the line. My favourite was definitely the spicy chicken with coconut milk and the Jamaican Jerk Chicken, which packed a proper punch. After the soup had bubbled and boiled for around an hour, we were ready to blend it up and finish things off – with Michael adding cream, fresh lemon juice and coriander to the Lemon Chickpea for an added kick. The Lemon Chickpea soup soon became my new favourite – by adding the fresh lemon juice and coriander right at the end, Michael said it allows the flavours to really stand out, rather than having them boil away in the melee of ingredients. Stunning! If you fancy making one of Nusa’s soups at home, try this to get your body feeling better post-Christmas! Bring vegetable stock to the boil. Add ginger, chillies (coarsely chopped) and crushed lemon grass. After about 10 minutes add mirin, chinese vinegar, star anise, cinnamon sticks and ponzu dressing. Bring to the boil. In the meantime, shred cabbage, dice carrots, dice water chestnuts and bamboo shoots. Soak the wood ear mushrooms for about 20 minutes or till softened before cutting them up into small pieces. Finely slice tofu, spring onions and coriander. Add all diced vegetables & tofu to hot broth. Let the vegetables soften, before adding spring onions and coriander. SERVE WITH NOODLES & SPINACH. 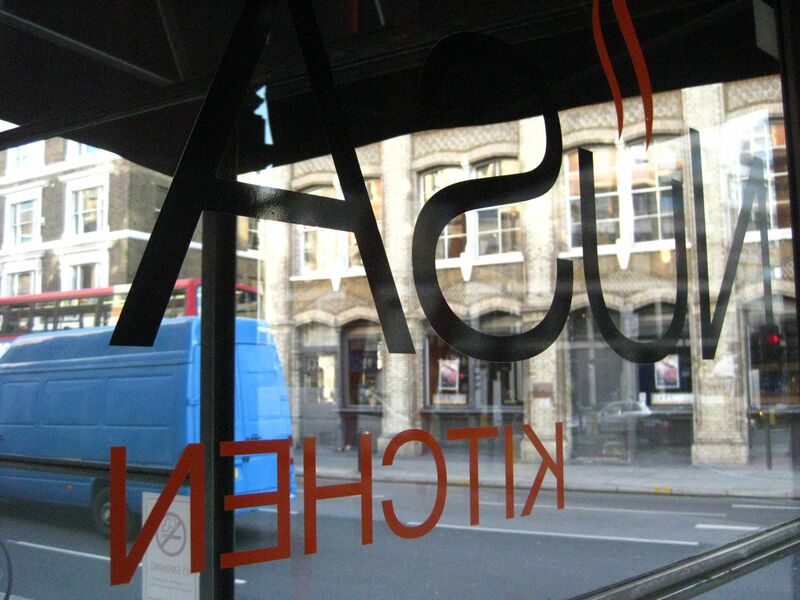 Nusa Kitchen has two locations: one at 9 Old Street (EC1V 9HL) and the other at 2 Adams Court (EC2N 1DW).